Live scores & real-time plays keep you on top of the action! Immediate game notifications for scores, close games, overtime, and more! Up to the minute team & player boxscore stats. Game preview matchup stats including the last 3 games played. View team standings by division or conference, including the latest playoff picture. Player & team stats, including league leaders in passing, rushing, sacks, and more! What's that channel? TV listings for all games included. Customize the schedule the way you want: filter by teams, division, or conference. Never miss a game! Set an alarm and be reminded to tune in. Check out the latest sports news while on the go. No connection? No problem! The entire schedule is on your phone & alarms are set locally. Check scores of previous games easily. 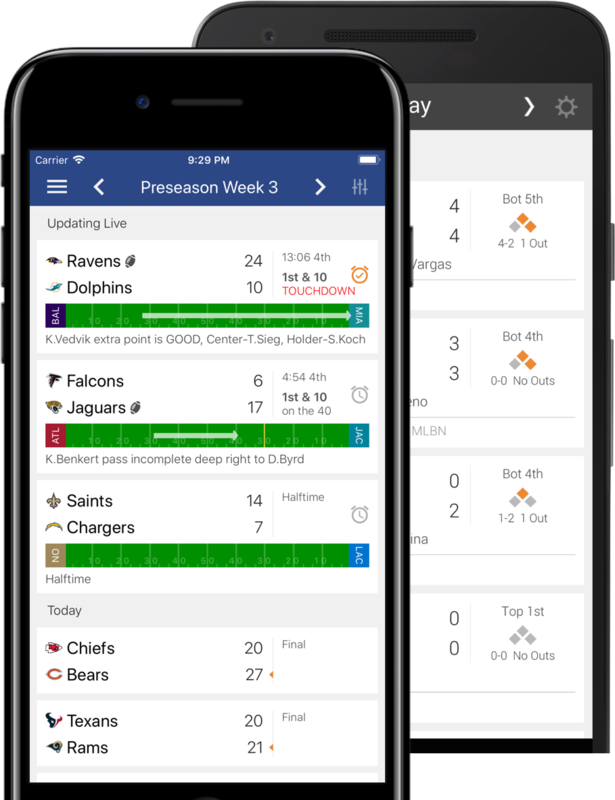 Sports Scores App is not endorsed by or affiliated with Major League Baseball, the National Basketball Association, the National Football League, or the National Hockey League. Any trademarks used in the app are done so under fair use with the sole purpose of identifying the respective entities and remain the property of their respective owners.